Whatley Manor in the southern Cotswolds was originally built as a farm house (and named Twatley Manor) in the 18th century as part of the farm estate Twatley farm. Since then, the manor changed hands several times, was renamed to its current name in the early 60s, and has been running as a hotel since 1987. Current owners of Whatley Manor are Alix Landolt and her son Christian, members of a Swiss family which made its fortune in the pharmaceuticals business (Sandoz); Christian is also well-known for being a successful dressage rider. These days the hotel houses twelve rooms, eleven suites and two restaurants, the upscale The Dining Room, and the recently relaunched casual Grey's Brasserie. 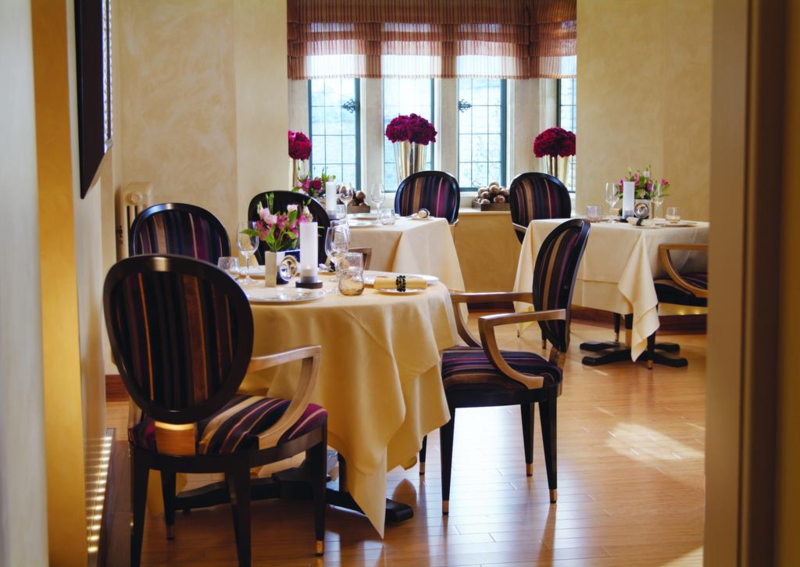 The Dining Room has had an established presence in the UK dining scene for a long time. For thirteen years the kitchen was lead by executive chef Martin Burge, who gained the restaurant two Michelin stars in 2009. Burge parted company with the restaurant in December 2016 and 25-year-old chef Niall Keating was appointed as his successor. A very young chef to take on this position, but Niall Keating isn't your typical 25-year-old, and brings considerable experience to his new job, having worked at top-notch restaurants such as two Michelin starred Sat Bains in Nottingham, three Michelin starred Benu in San Francisco, and Michelin starred Kong Hans Kælder in Copenhagen. The Dining Room at Whatley Manor is open for dinner Wednesday through Sunday and the restaurant offers one set 12-course tasting menu for £99. I had dinner with my husband at Whatley Manor in August 2017. The evening started with pre-dinner drinks in Whatley Manor's beautiful panelled drawing room, and here we were served the first course, a crunchy rice paper cracker dusted with togarashi chilli and sesame, and with a generous topping of crisp baby shrimps, dots of Parmesan-lime crème, freshly grated Parmesan and lime zest. An attractive combination of flavours and textures, the creamy saltiness of the Parmesan working wonderfully well with the spiciness. A fantastic and promising start. Once we were seated at the table, two more appetisers arrived. 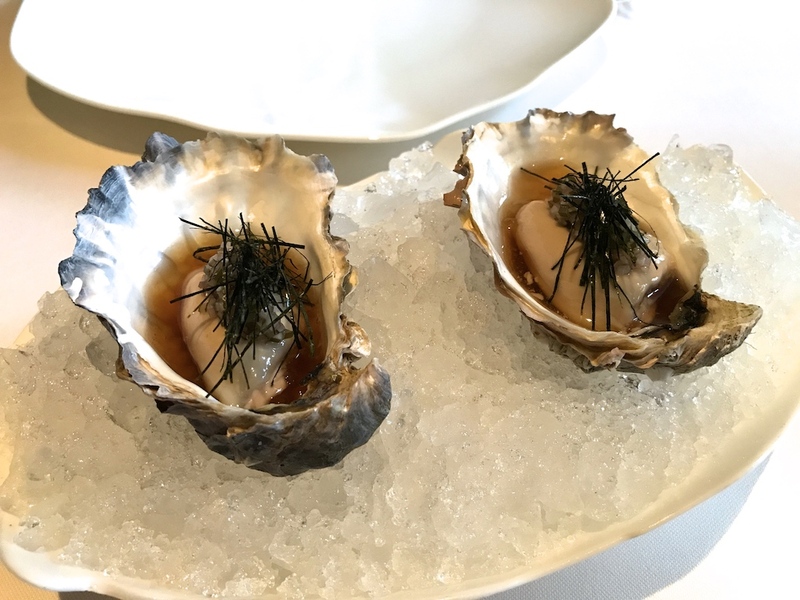 A juicy Porthilly oyster came in the shell with some tapioca pearls, a "mignonette" of kombu-infused vinegar, brunoise kombu and shallot, and topped with finely shredded nori. A pleasing combination, the nori giving the dish a nice finish and at the same time softening the pungent flavours of the mignonette. 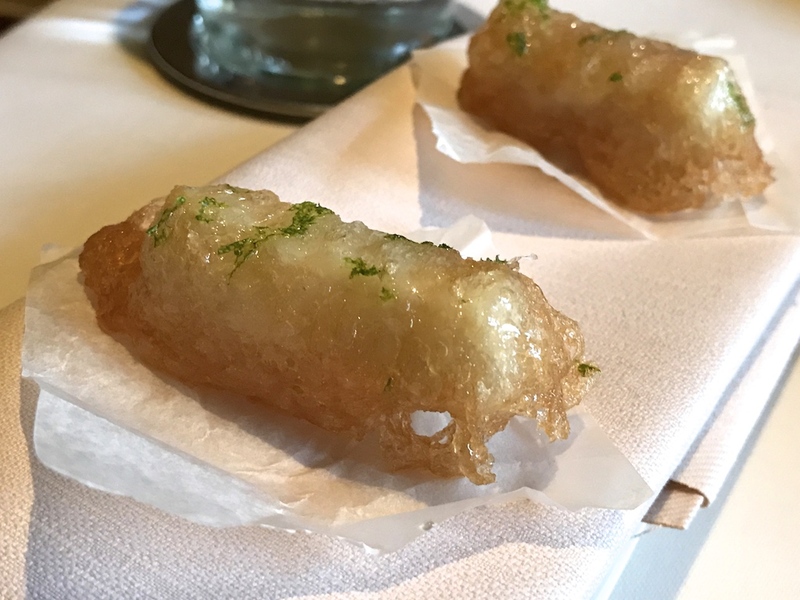 Equally pleasing was a piece of smoked eel tempura, glazed with a mildly sticky citrus "aigre doux" and finished with some grated lime zest, the latter balancing the richness of the tempura well. A clever touch. 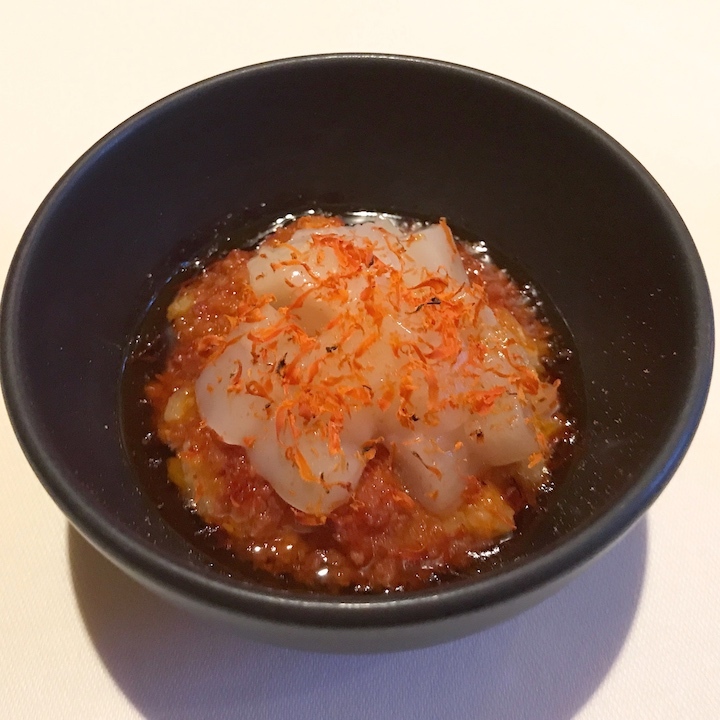 This was followed by an exquisite dish of creamy and delicate steamed egg white custard aka Chawanmushi, covered with an aromatic layer of salmon roe marinated in tamari (Japanese soy sauce), mirin, sake and citrus oil, and garnished with borage flowers. 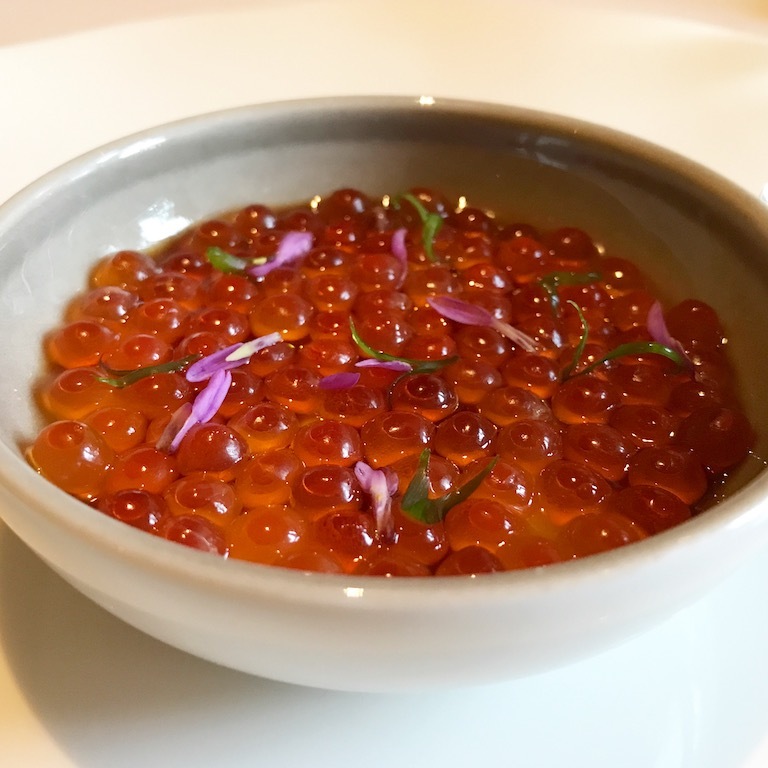 A highly seductive combination, the popping roe delivering a great textural contrast, and releasing their wonderful sweet and salty juices with every little bite. The marinating juices delivered a gentle salty finish. The fifth course on the menu was the bread course, a terrific 18-hour proofed sourdough loaf, served with a buttermilk and brown butter spread. Sixth course was raw Cornish mackerel dressed with bonito oil and served with pickled cucumber, soft kombu, preserved raspberries, nasturtium, and a dressing of raspberry vinegar, bonito flakes, and tamari. A lovely dish with a pleasing balance of richness and freshness, and nice umami notes. The creamy and rich texture/flavour of the mackerel was nicely offset by the tartness of the raspberries. Good use of kombu too, bringing additional texture and umami. The meal continued with two knock-out dishes. 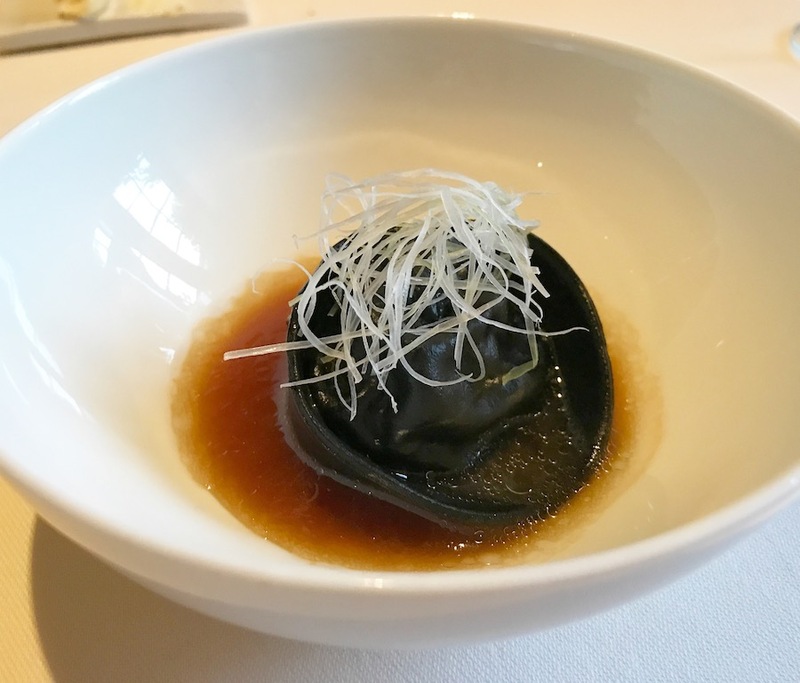 First up was a perfectly made large squid ink tortellini (tortellino for the pedantic grammar people) with a sublime, meltingly soft filling of soft pork meat, pork fat, and pork jelly, topped with some finely shredded spring onion. A flavour and texture experience similar to that of xiau long bao, the tortellini releasing a rush of pork juices as soon as you cut through it. Next these wonderful juices mix with the accompanying dressing of pork jus and black garlic oil, sharpened with black garlic vinegar, which resulted in a glorious flavour sensation. The tang of the dressing against the rich sweetness of the pork. This was followed by a brilliant dish of lush and sticky sushi rice risotto, complemented by a rich and sharp chorizo dressing, topped with raw Orkney scallop tartare, and garnished with grated dried scallop roe Powerful flavours coming from the risotto and the dressing, the spiciness of the chorizo soothed beautifully by the sweet and cool scallop tartare. A magnificent interplay of textures and temperatures. 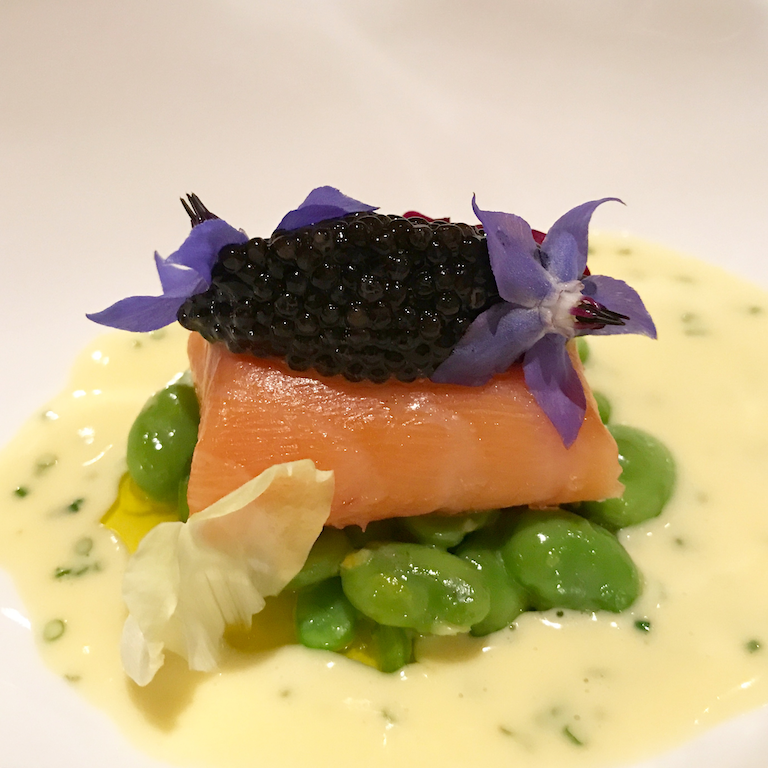 After this eclectic feast of flavours and ingredients, the next (ninth) course was a more traditional but luxurious pairing of confit Loch Duart salmon with Exmoor caviar, peas, broad beans, and a chive beurre blanc. A perfectly executed dish with superb salmon, which had soft and moist flesh, and married well with the chive beurre blanc, the latter having a lovely rich consistency. The meat course today was Highland wagyu beef (shortrib), cooked medium-rare, and creatively paired with a neat little stack of fermented lettuce, dill pickle, and fresh lettuce. Also on the plate were dots of wasabi crème, dill emulsion and a small dot of fresh wasabi. 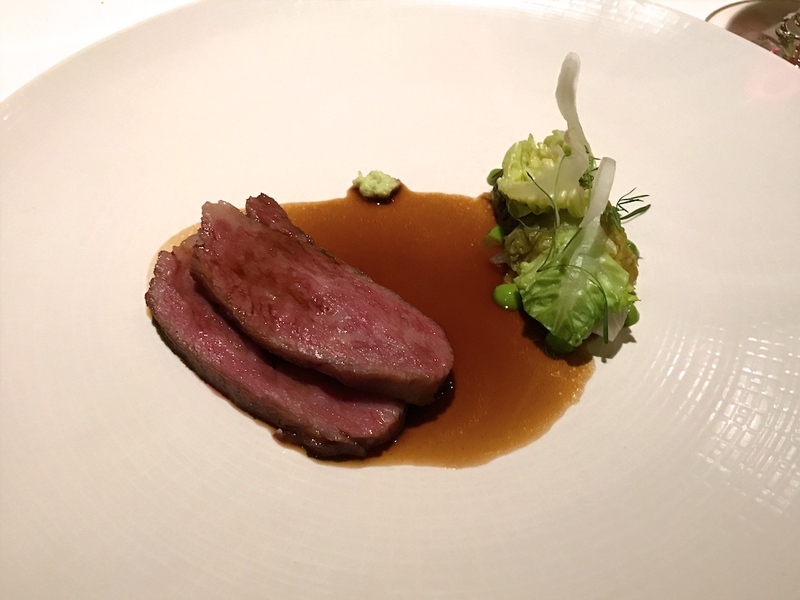 The glossy jus was a rich red wine and beef reduction, balanced with some kombu vinegar. Well-marbled and tender beef, the saltiness of the fermented lettuce and sharpness of the dill pickle stopping it from being too rich, and the mustardy heat of both the horseradish and wasabi enhanced the flavour of the beef wonderfully. On the the sweet part of the meal. First to arrive was a lovely palate cleanser of aloe vera sorbet served with pickled white grapes, some yuzu oil and shredded mint. 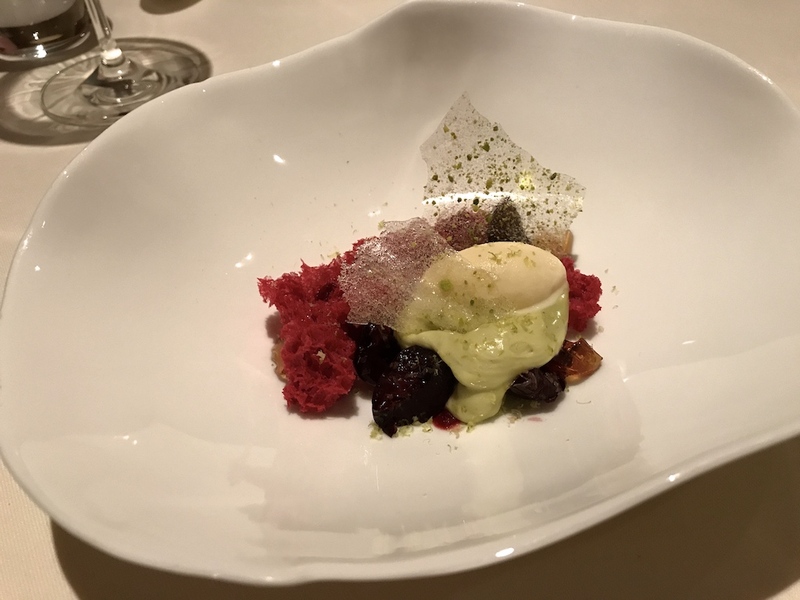 Next there was a dessert of crunchy and soft pieces of cherry sponge cake, compressed cherries, white chocolate and pistachio emulsion, marzipan ice cream, pistachio sugar shards, and amaretto jelly. An enjoyable but not necessarily strong dessert, especially the sponge cake needs some work. It delivered a nice colour but hardly any flavour. 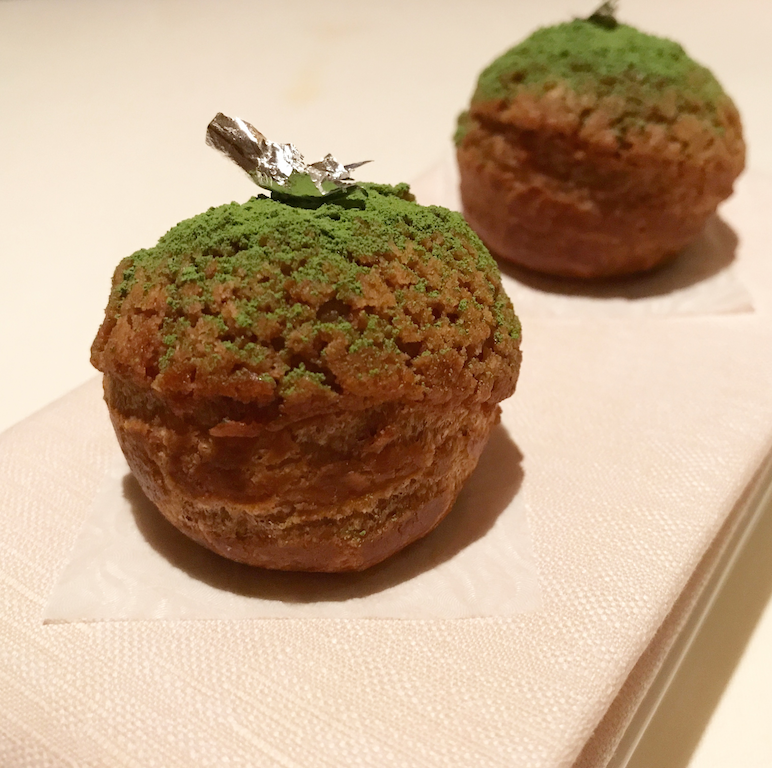 Much better was the next elegantly sweet treat, a terrific choux bun filled with matcha crème and lychee gel. 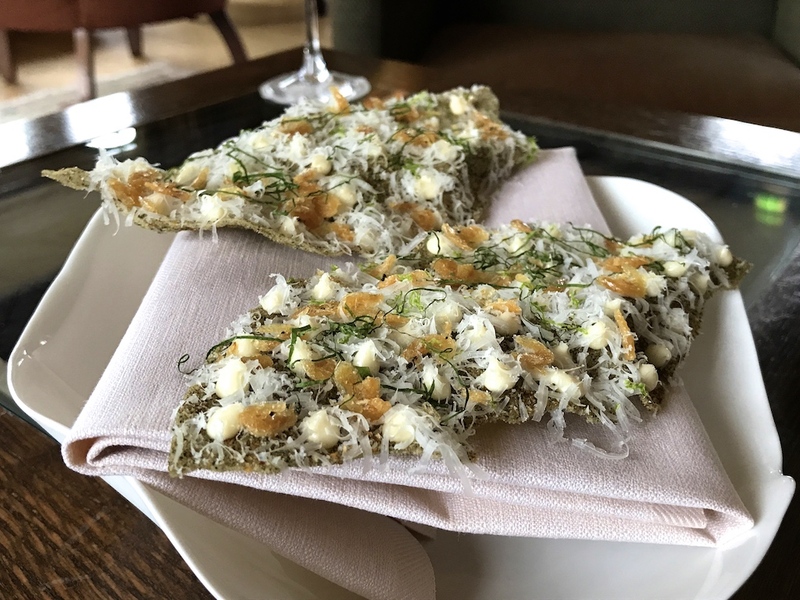 Appointing a young chef like Niall Keating, whose cooking style is clearly on the other side of the gastronomic spectrum to that of his predecessor, is a bold and brave move by the owners and the new manager Sue Williams (ex-Cliveden House Hotel). In fact, I haven't seen a similar move in the hotel-restaurant industry since the collaboration between Simon Rogan and Claridge's in London, which sadly ended recently. Whatley Manor is unquestionably looking to add a brand new chapter to The Dining Room, by moving away from the more traditional style of cooking you often find at Britain's country house hotels. A major change like this is bound to ruffle the feathers of some, but with this change of direction The Dining Room is clearly looking to appeal to a new audience. A logical next step would be to update the decor of dining room, so that it matches the new style of the food. Today's menu was well-designed, delivering surprise and original flavours and textures with almost every course, the desserts however, not reaching the same level as the savoury courses. Highlights were the tortellini and the risotto, two potentially risky dishes, that both worked brilliantly. Keating's cooking is heavily influenced by Asian, particularly Japanese, ingredients, but the more classically styled salmon course showed that he's well capable of cooking any style of cuisine. 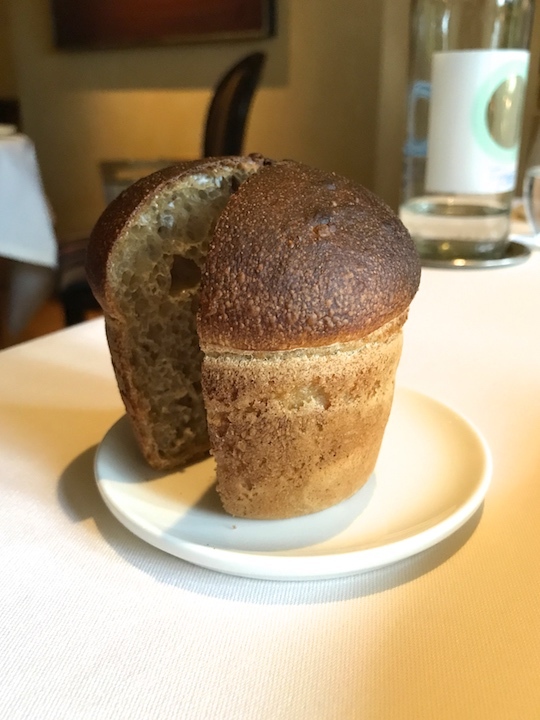 I'm a blank canvas when it comes to The Dining Room, as I had never been before, and I have to say that Whatley Manor with its manicured grounds and formal dining room, was the last place where I had expected to find such exciting food with cutting-edge flavours. Keating is already sprinting away, rarely missing a beat, and the promise and potential are significant. 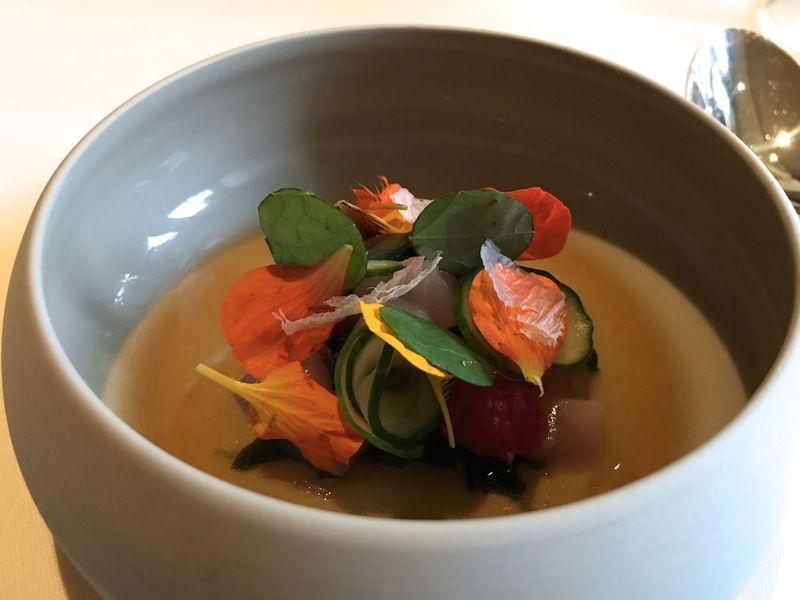 Those who are not aware of the recent changes might be surprised by the current cooking style at The Dining Room, but they will certainly not be disappointed by the quality of the food in relation to Michelin's two-star accolade.